Of the state’s 23 total vessels, seven are not currently running. Ferry riders traveling between West Seattle and Vashon Island or Edmonds and Kingston should expect longer than usual waits as the state ferries system struggles with multiple boats out for maintenance and inspections. Of the state’s 23 total vessels, seven are not currently running. Four boats await annual Coast Guard inspections and three are under maintenance, some of which is mandated by the Coast Guard. Out-of-service boats, particularly in the winter months, aren’t unusual. 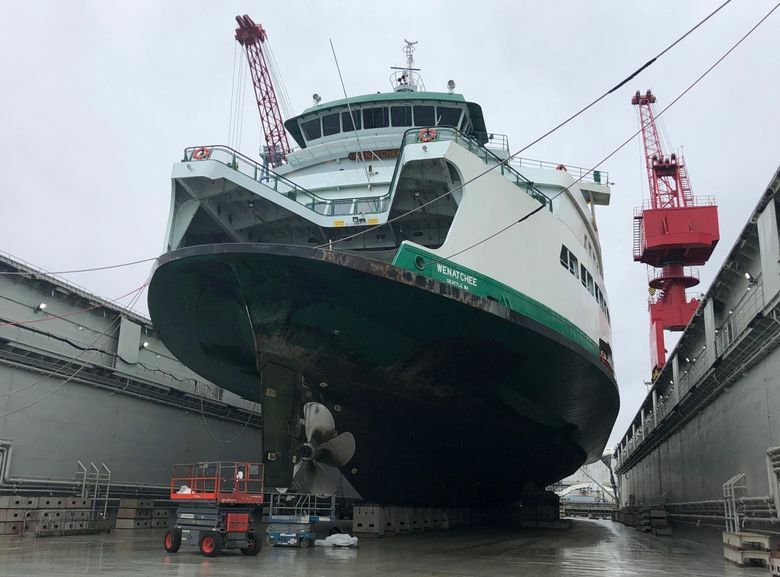 Washington State Ferries (WSF) typically schedules maintenance and inspections for this time of year, when ridership is lower. But one particularly tedious repair is now having ripple effects and disrupting multiple routes. The vessel Wenatchee was damaged by a crab-pot line, and the agency planned to do the repairs starting last weekend. But the damage to the boat’s propeller shaft seal was more extensive than anticipated, and the boat is now expected to be out of use through the week until Sunday or Monday, said WSF spokesman Justin Fujioka. In total, the agency needs 17 boats to operate a full schedule at this time of year, so there’s room for some repairs. With seven out of service, there’s one less boat than necessary for a full schedule. The Wenatchee typically operates on the Seattle/Bainbridge Island route, the system’s busiest, so the state shifted around boats on other routes to replace it. Meanwhile, the Fauntleroy/Vashon/Southworth route, known as “the triangle,” usually has three boats, while routes to Bainbridge, Bremerton and Kingston have two each. So, the state scaled back the triangle route to two boats instead of the usual three. “We’re basically trying to pull the Band-Aid off where it would least hurt,” Fujioka said. Passengers can find the adjusted sailing schedule on the Washington State Department of Transportation’s website. As a result of the shifts, smaller than usual boats are running on the Edmonds/Kingston and Seattle/Bremerton runs. One vessel on the Kingston route is carrying about 60 fewer cars than the usual boat on that route, and one boat to and from Bremerton is carrying 20 fewer cars. Fewer sailings and smaller boats mean fewer passengers can make the crossings. Plus, unloading completely full boats can take longer, causing delays. WSF urges people to try to walk on, instead of driving, or avoid peak hours if possible. Passengers should expect longer waits on the triangle during the week and between Edmonds and Kingston, particularly over the weekend, according to the agency. The agency has long dealt with an aging fleet, now compounded by growing ridership. Seven of the state’s ferries are more than 40 years old. Gov. Jay Inslee’s proposed budget includes money to begin construction of two new electric ferries.